There’s still time to save during Sturbridge Yankee Workshop’s Annual Fall Lighting Sale. If you’ve been waiting all season to purchase your lamp, now is the time. We have lighting options for all homes, from night lights to chandeliers and everything in between. Perhaps you are in need of a new decorative accent for a side table or mantle space, but don’t have the room for this and a lamp. At SYW, we ask: why not combine the two? A great way to do that is with any of any of our table lamps that are designed as an antique replica. These unique lamps provide an interesting decor element, as well as the additional accent lighting you might need. For example, pictured here to the left is our new for fall 2012, Phone Lamp. This replica of a candlestick style phone is modeled after phones once used in the early 20th century. Made of a brushed copper metal with black undertones, the Phone Lamp captures the true antique nature of the phone with complementing black linen drum style shade. Its black resin phone receiver or “handset” is removable off of the holder and is attached by a black cord. It makes for a real conversation piece if displayed in a home office or hallway; on sale now for only $139.95. Another replica antique lighting option at Sturbridge, is the Scale Lamp seen here to the left. Our captivating Scale Lamp offers yesterday’s charm with today’s functionality. It begins with a metal base inspired by postal scales of the early 1900’s. Topped with a wheat colored fabric shade, it’s sure to be a hit in the kitchen or other casual living space. This 15.5″H lamp is available for just $99.95. 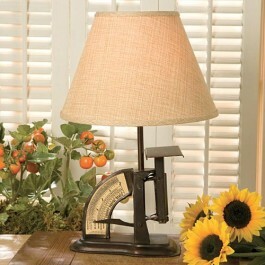 Continuing on with our theme, consider either the well crafted Sewing Machine Lamp or the durable Pharmacy Desk Lamp. 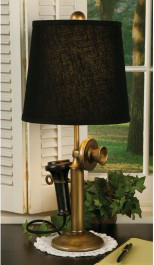 Our Sewing Machine Lamp (shown below) would be a nice accent in a craft, sewing or laundry room. Produced with amazing detail, right down to the tiny needle and thread, the base resembles some of the early models of Singer brand sewing machines; on sale this fall for $129.95. The Pharmacy Desk Lamp on the other hand, is more masculine in design, and is suited for the home office or small work space of your home. Ideal for additional spot lighting, it features an adjustable light on the top portion to appropriately direct the light where you need it most. And a final idea when it comes to table or accent lamps with antique reproductions in mind, our Spice Grinder Accent Lamp. Perfect for the kitchen windowsill, customers can purchase this cute accent light for just $39.95. Don’t wait, there’s still time to save during the Sturbridge Yankee Workshop Lighting Sale. This entry was posted on Monday, September 10th, 2012 at 9:28 am	and is filed under Decorating, Lamps and Lighting. You can follow any responses to this entry through the RSS 2.0 feed. You can leave a response, or trackback from your own site. 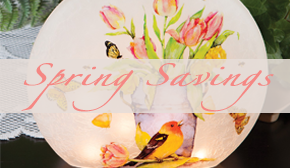 This is a great lamp deal! I’d like to buy this for my newly built room. I’m glad that I’ve come across this page. Great deal!!! 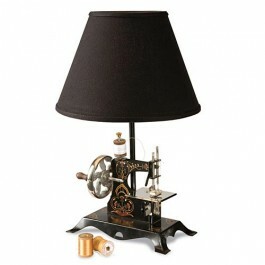 Looking to purchase small antique sewing machine table lamp like the one above. Can you forward some information to me, pricing, etc.